Below are testimonials from my generous Thai language students. 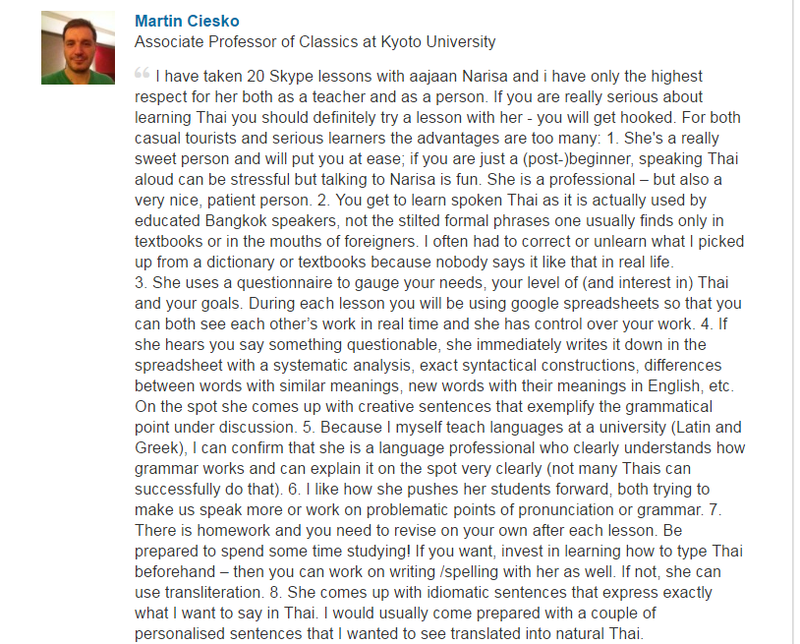 Martin Ciesko Ph.D.: A Language professor and an experienced learner of Thai language who wanted to improve speaking skill and be able to read Thai novels. KT: A Complete beginner who wanted to start a business in Thailand after graduating from Harvard Business School. Elliott Hoel: A Half Thai-American Harvard medical student aiming to communicate with the Thai relatives and later work as a doctor in Thailand. Angela: A professional teacher from U.K. aimed to communicate in Thai at a better level and to pass the Thai Language Test for Permanent Residency at the Royal Thai Immigration in 2016. Congratulations! She passed! I have only great things to say about Khun Narisa and her teaching style. Before I studied with K. Narisa, I studied Thai in a classroom setting and learned the basics of reading, writing & speaking. However, I had very little confidence when speaking. Learning with K.Narisa via Skype allowed me to practice speaking in a safe, controlled environment and get all of those embarrassing mistakes out of the way in the privacy of my own home! Also, since we use the chatbox, I get to practice typing in Thai. At first, it was painfully slow to hunt-and-peck all of those squiggly little lines that were hiding all over the keyboard, but K. Narisa is very patient and eventually, I improved. I would definitely recommend K. Narisa to anyone looking to take their Thai to the next level. I’ve been learning Thai using Skype with Narisa for about 14 months now. I hadn’t heard of it until I saw Narisa’s advert on a website and she mentioned it as a way to learn. I’m glad I found it as a way to learn as it’s so easy to use and the calls are free. Apart from the obvious time difference between the UK and Thailand there isn’t a downside IMO. It’s just like talking to someone in the UK on the phone. I just purchased a Skype headset, installed Skype, added Narisa as a contact and was ready to start learning straight away. Currently I am learning twice a week. 1.5 hours speaking and 1 hour reading atm which I feel is enough for me. I used to do more but as my knowledge and speaking and understanding have increased I felt I didn’t need to do as much. Narisa is a very patient and methodical teacher who goes the extra mile in helping her students progress and reach their goals. As an experienced teacher, Narisa knows how to tailor her teaching methods to suit each individual student to gain the maximum results. She is able to communicate effectively with good English to help you understand and answer any questions you may have during lesson time which is essential. I have embraced what Narisa has taught me so well and used my new found Thai speaking skills to communicate effectively when on trips to Thailand. It’s a shame that Narisa isn’t there to see my progress first hand whilst I am speaking with other Thai’s, to see how much she has helped my progress in this challenging but beautiful language. Sawasdii krab. Great teacher and Great lesson!!! I am a procurement manager and I have been learning thai for 4 months with Narisa. I can feel I have improved my abilities in Thai a lot (Sounds and phonetic, Pronunciation, vocabulary, understanding)after 21 hours class. Of course like everything, it supposes you to work by yourself as well to improve faster. I feel very happy to learn thai with Narisa. Very good teaching skills…Implicated in her job, very professionnal, pay attention to your question, flexible, open-minded and funny… I love learning thai language with Narisa and I keep going studying with her. If you want to learn thai, I will recommend you Narisa for sure. She is a very good teacher and a nice person. Many thanks Narisa!!! I have advanced from beginner to intermediate in my first twenty hours with Narisa which, for me, is excellent progress. Her teaching style has given me the Thai lexicon and structures that most closely resemble my own conversational style which, I think, greatly enhances one’s ability to retain what they have learned. I highly recommend Narisa for anyone interested in learning Thai. Fabulous Long Distance Learning Experience. K. Narisa brings the age old question of how to efficiently learn a foreign language into the 21st century. By using Skype she is able to teach Thai to students around the world at any time and in any location. As a businessman, I appreciate the flexiblity of being able to have a lesson in my office at a convenient time, and if I need to make a last minute cancellation I know that the teacher has not spent a wasteful hour in taxis. Knowing not a word of Thai before we began, K. Narisa has been superbly patient with me. Her flexibility extends to the lessons themselves, as we discuss things relevant to my business. My Thai vocabulary is most likely different from others, as K Narisa caters well to the individual needs of her students. Although I learn many terms related to business, the lessons are also practical and, after only a few months I can now adequately converse in restaurants and give instructions to taxi drivers. By using Skype, I can record our lessons and play them back at any time…the IM function allows me to see and read what she is teaching me to provide written reinforcement to the oral lesson. I can think of no better way to learn Thai, and certainly can think of no better teacher than K. Narisa. She is highly recommended to students at any and all levels of proficiency. She is easy to work with and extremely helpful. I met K Narisa many years ago when I was working in Bangkok where she was my teacher. Unfortunately for me then I was working up country every week Monday to Friday and could only be there on Saturdays. I learnt a fair amount until my company sent me out of Thailand to work elsewhere in the world. Since then until this year I have been in and out of Thailand and mostly living up country as I do now I am retired. I was looking for a Thai teacher locally and in the area that I live in my wife and I must have been to nearly 20 schools as far as 50km away to try to find someone but we could not. I have been a member of this website for a while and now I am retired I thought I would try through here. 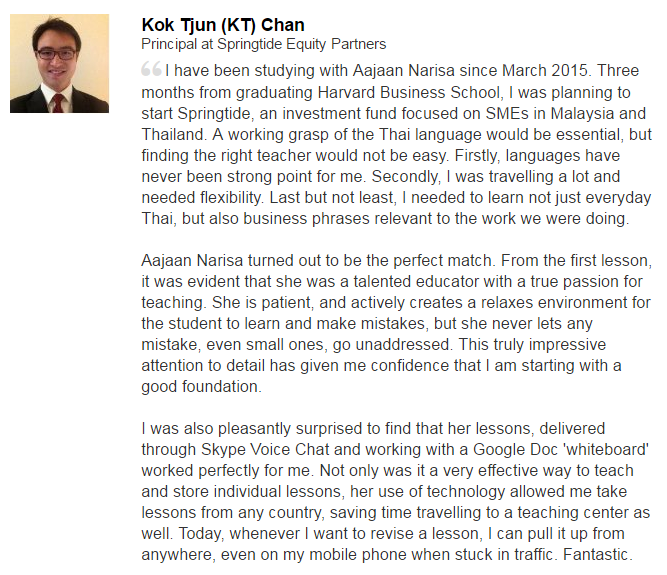 I found K Narisa once again and asked if she could teach me once again but this time as a distance learner via Skype. She said she can do this so we started. Firstly I am 66 and partly deaf in both ears which does not help matters and I often forget things too. We went back over what I knew and remembered which was a bit more than I thought. After that she decided that going back to basics was not worth the time so we talked in English. K Narisa would then put it in Thai speech and using Skype messenger and a program called Callburner we would use the hour of study twice a week. I would download the recording and the notes as a record to go back to to recall and learn from. It would be a description of what I had done on a day and what I thought I said and what I should have said. I found that is better than parroting from a book though the books give me a better understanding offline and I highly recommend anyone to learn this way. I would still be working with her but as I said I live up country and have no house telephone so I am reliant on a mobile phone, an EDGE connection and a vain hope that not many people are using the 1 cell site I am on. Many times however too many other people were using a mobile phone and squeezed my internet connection to the point where we could not hear each other. Working with K Narisa is always a pleasure and if anyone needs a Thai teacher face to face or through the internet and Skype I cannot recommend her highly enough. I only wish I had a better connection and I would still be there. The best teacher I have ever had in my life. I have had 24 hours of lessons with Narisa and I think I have made good progress. My lessons are always very interesting and informative and are taylored to my personal needs. I can not recommend Narisa to highly, she is a very talented lady with exceptional teaching skills and a very comprehensive understanding of the English language, vocabulary and diction. Naris is a professional in all aspects. She is bright, witty, knowledgeable, intuitive and an experienced teacher who has saved me many hours of frustration in learning Thai. She is extraordinarily effective with her teaching approach, for she engages you easily in conversation at your level, and gradually explains all the aspects of the conversation. The result is that you move much faster in learning Thai than with conventional instruction, for you learn what you want and need to learn to say instead of a canned approach. I think that an hour with her is equivalent to several hours of trying to learn by yourself from books or CD’s, or from taking formal classroom instruction, for that matter. In addition, she is intuitive and demanding as an instructor. She politely keeps you on track, and the results show it. I cannot recommended her highly enough! I’ve been very impressed by the standard of tuition offered by Narisa. She has her own booklet resources which she emails over, and she is very responsive to teaching Thai for the specific needs of the learner. I try and keep a (very short!) Thai diary – and each week we go through that as well. She is also a very enthusiastic and a patient teacher – important qualities in language tuition. I have signed up for another 10 hour course with her because i have been very happy with my progress with her so far. I have been travelling to Thailand for years now, and I have some family there who own several businesses. After being offered the opportunity in the near future, to come to Thailand and work in the family business, I decided I would be better off if I learned some of the language. I started off by teaching myself some key words, and I tried a few software based learning tools which gave me a starting point, but I decided that I would seek out professional assistance and try Ms. Naropakorn’s lessons via Skype. Being a CELTA certified English teacher myself, I can see that Ms. Naropakorn uses very effective teaching techniques, and I have learned a few neat tricks about language teaching from her as well. I have been taking her lessons for approximately six months, doing two lessons per week, and I have noticed a huge improvement in my vocabulary, grammar, and my reading and listening skills. At first I was a little skeptical about doing lessons over Skype, but I found that it is an easy, and effective way to learn from a native speaker. I am Adam form Australia, I started learning with Narisa at a beginner level 5 weeks ago and I am already starting to feel more confident about my Thai language skills. Narisa is very professional and the lessons are well planned, I have both learned a lot and enjoyed myself during the lessons. I strongly recommend Narisa to anyone wanting to learn the Thai language. Narisa is an excellent teacher and I would highly recommend her to anyone who is serious about improving their Thai language skills. Her pronunciation is clear and she explains every topic in depth so it is easy to understand and learn. She’s been very flexible in adapting her schedule to meet my needs as I’ve moved across three different time zones this summer. She’s very reliable, always beginning our lessons on time and having a clear, well thought out lesson plan. I look forward to continuing to learn from Narisa in the future. I have been very pleased with the lessons that i have had, and i have found Narisa to be very flexible and accomodating, I feel that i have improved my vocab and pronunciation and that the lessons have been tailored well to my needs. I do recommend this form of study and have no hesitation in recommending Narisa as a Thai teacher. I completed 10 hours of lessons with her in February, and now thinking about going back to the class with her again. That’s clearly because she’s a very effective & talented teacher. Like a really gifted teacher that she is, she’s well prepared for each & every lessons, and the classes are very effective & systematic. She also has a deep knowledge about Thai culture, which makes the classes very colorful & fun! With your help, I hope I can improve my abysmal learning skill as well, khun Narisa!!! Narisa clearly speaks Thai and English very well and will not rush beginners that look to learn Thai. She has her own unique way to teach the Thai language and you can learn from your own computer at home no matter where you are in the world. She is very patient and I am learning alot so quickly in a short amount of time. Always responds to your emails and is flexible as well. Definitely take the time to meet her if in Thailand. She is lots of fun and I have made a lifelong friend…. I have been learning Thai at a higher beginner/intermediate level for the last couple of months. Narisa has a very flexible and fun approach to teaching which really enhances the learning experience. My previous Thai language knowledge was aquired from the Pimslars course and Learn Thai podcast. But I wanted to take my Thai to the next level and really learn seriously. I have learnt so much in such a short space of time and am very happy with my progress with having regular lessons with Narisa. I am really looking forward to the future and progressing even more with Narisa. If you are looking to learn at any level of Thai then this is the teacher for you. Narisa Narapakorn has been instructing me in the Thai language for several weeks now, and she asked me to submit an evaluation of her teacning to this website. Narisa’s teaching technique is splendid. She is friendly, organized, flexible, and very good at what she does. My needs were rather out of the ordinary curriculum, yet Narisa adapted her course content to teach me what I needed to learn, rather than forcing me to glean what I could from an established curriculum. She is always prepared, and excellent in diagnosing her student’s difficulties with learning the language, providing practical suggestions to overcome them. Narisa’s lively sense of humor makes these language lessons a pleasure. I recommend her as a teacher to anyone interested in learning Thai. I have completed 5 hours of internet based class time with Narisa. I was originally concerned with how effective the internet would be for learning Thai. At this point I find Narisa’s teaching method to be very effective and I am extremely happy that I started the classes. Narisa is an excellent teacher. Her English is perfect and there has not been a single instance where she was not able to effectively explain the Thai usage or translation. The material she provides for the class is excellent. The provided material combined with the verbal practice (and ability to record the lessons) allows me to go back and practice areas where I am having trouble. This is an excellent tool and makes the on-line lesson a very close approximation of a class room experience. The lesson sign-up and payment process was easy and I never had any concerns. Narisa is a true professional. The classes start and end on time and she is very good about updating classes taken and the remaining status. In summary I am very pleased that I found Narisa. The classes are fun and the hour flies by much too quickly. I would highly recommend Narisa to anyone who is interested in learning Thai. Narisa is a very competent teacher. Very friendly and reliable. My name is Justin and i am from Australia. I am a company director. I wanted to learn Thai because I have a daughter living in Thailand and I wanted to able to speak her language. In the time we have spent together my understanding of the Thai language has come along in leaps and bounds. She has a nice easy manner and i found her to by very professional and reliable. Narisa dii aa jaan. Chook^ dii krab/(If you can’t read this then Narisa will have you understanding it in no time).